US Cellular, come on down: you're the next contestant on The Price Is Free. We've seen the first over-the-air update roll in for Moto X models on T-Mobile, Sprint, and AT&T, and now Motorola has posted details on a nearly identical upcoming update for US Cellular. That will probably makes Verizon the last major carrier to apply the Moto X update. Try not to act too shocked. As you can see, the 139.12.57 follows the updates for other carriers point-for-point. It's still Android 4.2 - this is a maintenance update. The biggest change is to the camera, which gets improved low light performance and faster focus, plus faster switching between the cameras and the gallery. Considering that the 10MP camera is one of the Moto X's most deficient specs when compared to other recent flagships, this should be good news for shutterbugs. The rest of the software additions fall loosely in the realm of bug fixes, including a revised version of the voice-activated Touchless Control feature and improvements to call quality. The Motorola page doesn't say when the 139.12.57 update will be sent out to end users. 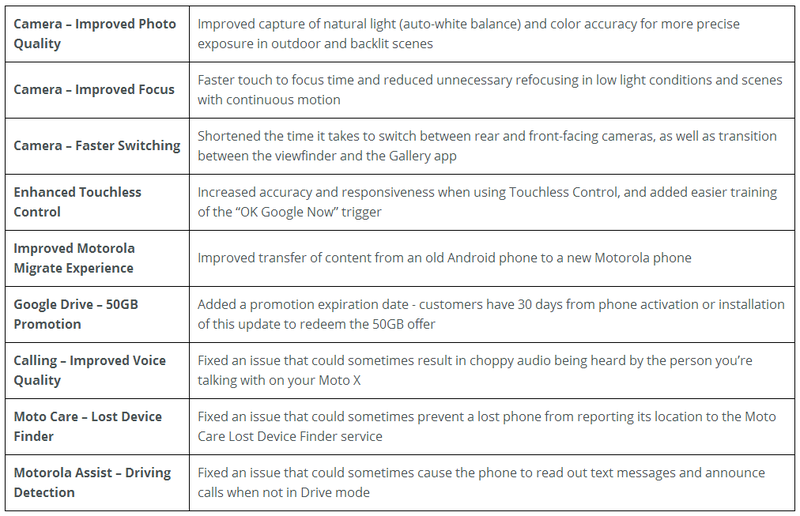 You can always go to your Settings menu and check manually, but since the Motorola support page has been posted, it shouldn't be too long before the update is flying out to an Android phone near you.